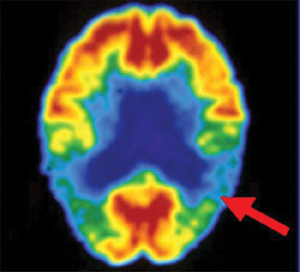 PET scan depicting the effects of Alzheimer's disease on metabolism. The arrow indicates areas of low activity in the parietotemporal cortex - a region important for processing language and memory. A PET (positron emission tomography) scan is a procedure used to observe the brain, the heart, and tumors. You will be given an injection of a low-level radioactive material and an organic chemical. This liquid will travel to the brain and heart. The scan shows the distribution of the radioactive material and what is happening in the organs. As an alternative to this test, you could choose not to have treatment, recognizing the risks of your condition. You should ask your doctor about this choice. Follow the doctor's instructions. The night before the procedure, eat a light meal such as soup and salad and don't eat or drink anything the morning of the procedure. The PET technologist will inject a low-level radioactive material and an organic chemical into your vein. You will lie down on an examining table that slides into the PET machine. The technologist will then take pictures that help the doctor understand the health of the organs scanned. The PET technologist will send the complete report to the doctor, who will interpret the results. You should ask your doctor what other steps you should take and when you should come back for a checkup. This procedure will help the doctor make a more accurate diagnosis. You may have an allergic reaction to the chemical used in the scan. You should ask your doctor how this risk applies to you.